This new range of HMI (Human Machine Interface) and PLC (Programmable Logic Controller) is ideal for motion control of stepper drivers, servo drives and brushless servos. With this very competitively priced range, there is no need to purchase a separate HMI and PLC with all the problems of wiring them together. By using our newly launched, fully featured Colour LCD touch screen HMI with inbuilt Motion Control PLC, it has pulse outputs up to 400kHz for stepper or servo motor drives. The products are extremely cost effective and include free programming software which enables ease of programming on your machine. 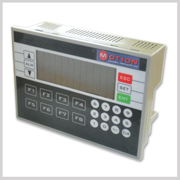 Our new HMI and PLC's also have a host of options, so we can also supply a particular product from our range to suit your motion control application needs. You also have the option to use Motion Control Products programming service, online technical support and remote desktop assistance which is available to you. Please contact our sales department for more details.